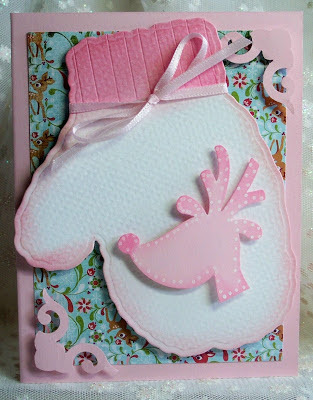 Today we are going to take a look at a mitten die from Impression Obsession. So many ways to use this really cute set. The set includes three dies, the mitten, the beautiful snowflake and the bow. The first thing I did with it was make a simple holiday card. a post-it note across where I wanted the cuff to end and inked the cuff with the same ink. I then scored lines on the cuff section. The background paper is Basic Gray, Eskimo Kisses. Corners are a Paper Shapers punch. White Marker. Tied a thin pink ribbon around the base of the cuff. This is the inside of the card. Stamped sentiment is Penny Black (3517F). Deer punch is Martha Stewart. Secondly, used the mitten to make a money holder. 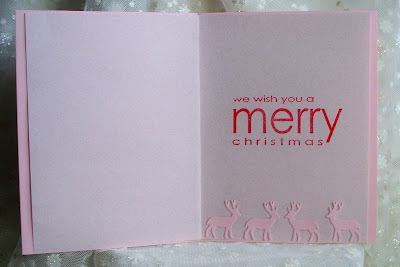 Added the die of the bow also run through the embossing folder. Heart is a Marvey punch. Snowflake is also a punch. Button and string bow added to cuff. To make a money holder, I cut a second mitten in white card stock. 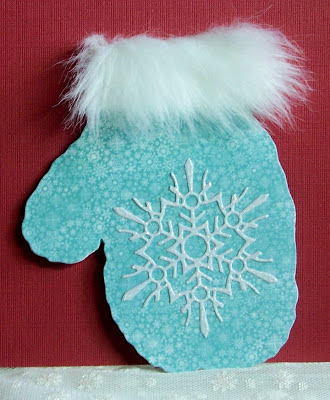 the mitten and long enough to fold up to create a pocket to hold the money. 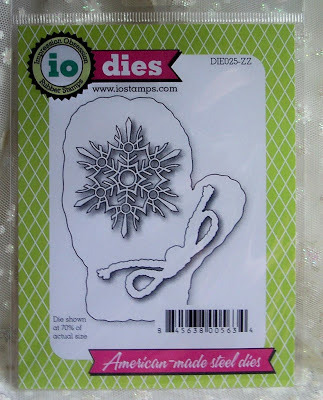 The stamped image is Jillian Clear Stamps. 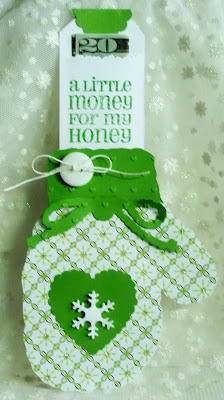 I used a circle punch (fold the circle in half and glue) to make a tab to pull out the money and greeting piece. #3 is a Gift Tag. 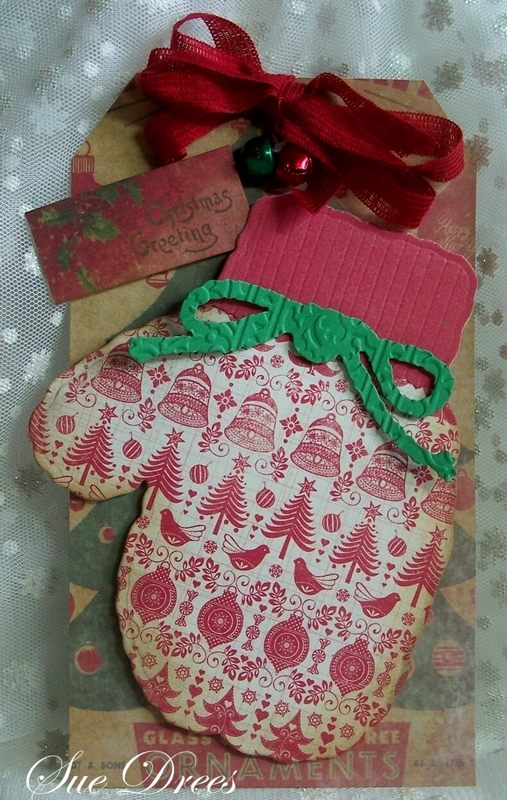 The tag was made from papers from the Tim Holtz seasonal Stack, including Christmas Greetings tag. The mitten was cut from papers from the Authentique 6x6 Stack. Cut red card stock and scored it to create the cuff. Bow was run through an embossing folder for texture. Inked around the mitten with Frayed Burlap distress ink. Added a thin fabric bow and two small bells. 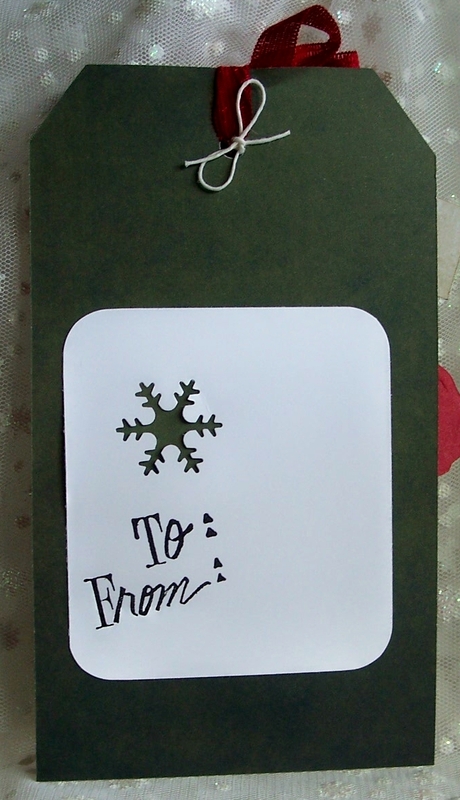 This is the back of the gift tag. Added a white fur strip across the top and cut snowflake from white glittered paper. 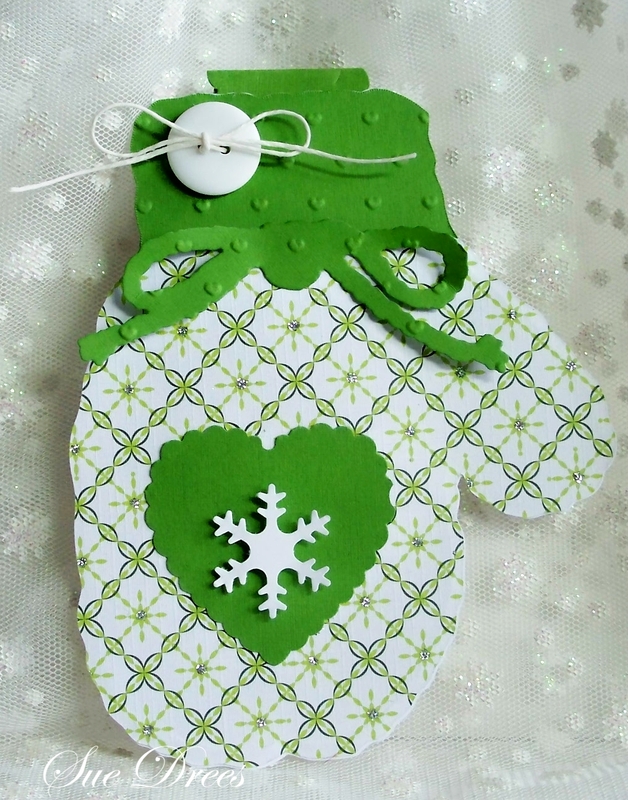 Inside of mitten card. Sentiment is by Northwoods . other ways to use it too. Fun die. Just look at all the variations.I think the bli is my fav, but i like the scored cuff too. Fun die. Just look at all the variations.I think the blue is my fav, but I like the scored cuff too. Wow - you have convinced me for sure! I NEED this die. What unbelievably fun ways to use it - I love that you shared several fun and creative ways to use this. 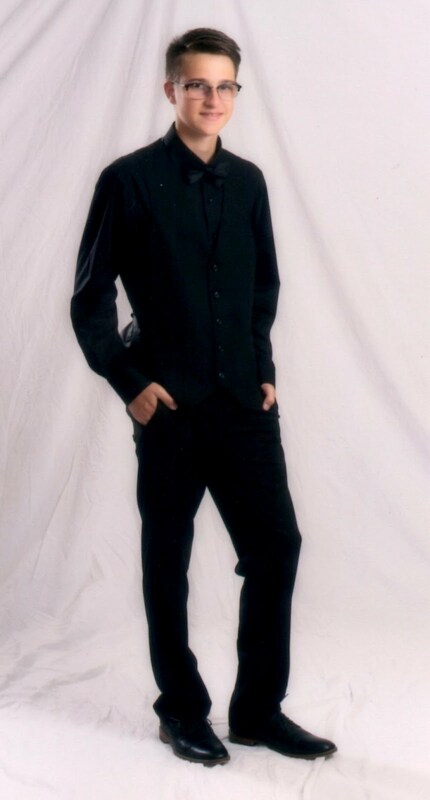 You have such a fun style! Hugz!